Regenc Yacht Vacation sales brokers know what works for charter. Ask about investing in a charter yacht. Before you buy, think about what your primary use of the yacht will be. Will it be solely for private use, say for family vacations? If so, how many guests would you normally have on board? Short trips and anchoring out, or perhaps long-distance cruising offshore? Do you prefer air conditioning or tropical breezes? Sail or power? Are you thinking of buying a yacht with a paid crew, either as a full-time charter vessel in the market or as a part-time yacht? This may call for a very different yacht than what your personal desires might lead to otherwise. We are experts in helping buyers find the right solution to your needs. We also have over thirty years of experience in the Caribbean charter yacht industry; we know the boats and we know the area. Our expertise can make the decision between a frustrating (and perhaps costly) experience, and the smooth acquisition of an asset that will bring you personal satisfaction and enjoyment for years to come. We have access to thousands of yachts for sale around the globe and can provide a yacht that is virtually custom-tailored to your needs. 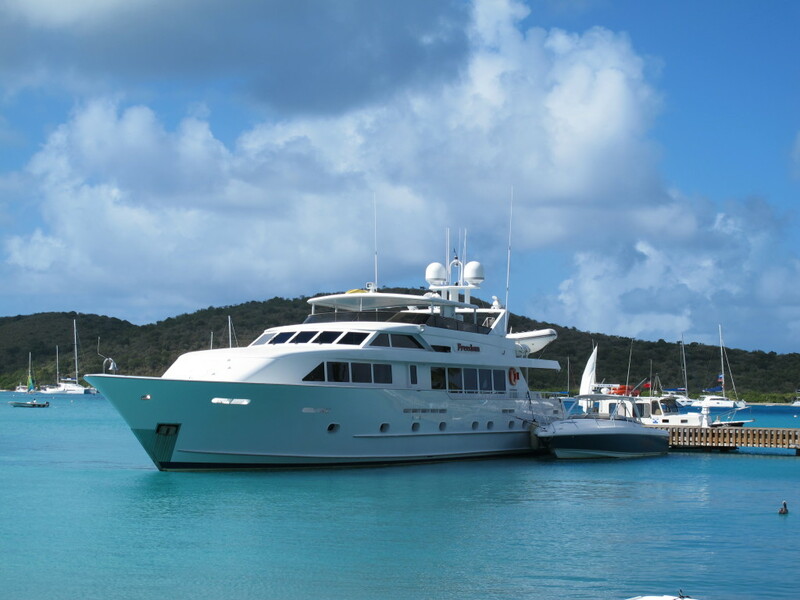 Power yacht at the dock in the BVI – Regency. Where will your primary use of the vessel be? If in the Caribbean, be aware that there is an annual Atlantic Hurricane Season (June 1-Nov. 30). Many yacht owners and operators plan on hauling their vessel during this time and storing the vessel on land in a boatyard. Others prefer to continue using and operating their vessels, and make a seasonal migration outside the area generally accepted as a storm danger zone. Often described as “the box” for insurance, it may usually be defined as from the Florida/Georgia border south to just north of Trinidad / south America and west to Jamaica and Texas (every insured should note the exact definition of this are by their own underwriter, and the conditions that may be specified). Arrangements for yard services should be made as far in advance as possible, as many charter vessels have standing annual reservations. Life is about compromise and so is a yacht purchase. Your dream yacht may be located in the Mediterranean – are you willing to fly over to view her and sail her back across the Atlantic? Or the perfect boat to charter may be asking double the budget you set. So make your wish list and rate which items are most critical, but then be willing to adapt and be flexible when a yacht that hits 8 out of 10 points comes along so you don’t get left standing on the dock watching someone else sail off on their newly purchased yacht. Don’t rush the buying process, especially if you’re new to yachting. It entails much more than simply turning on the key and pulling away from the dock. It’s a different environment and the more time and effort you put into the proper selection of a yacht for your needs, the more you will get out of it.